Beware the Blob or Son of Blob was one of my choices to rent on my birthday at the age of twelve (the other was, Godzilla 1985 (1984)). I’m pretty certain I was the only one of my friends who managed to stay awake through the whole thing, which was good because that way they couldn’t see me still a little sniffly at seeing Godzilla fall into that volcano. 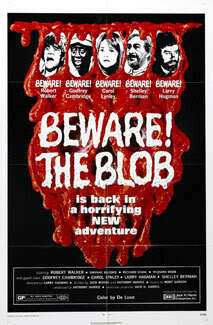 The Blob (1958) was one of the weirder monsters to come out of the 50’s. I’d rank it up there with the brain monsters from Fiend Without a Face (1958) and the giant telepathic crabs that absorb your intelligence in Attack of the Crab Monsters (1957). Possibly even stranger is the idea to make a sequel to The Blob fourteen years after the fact, make it a dopey comedy and let Larry Hagman direct it. Like you would expect, the opening credits for a Blob movie feature a kitten frolicking in a field while some weird synthesizer music plays. When we last left the Blob, it was being dumped off in the Arctic in hopes of keeping it frozen for good. Evidently the government didn’t bother telling anyone and did a sloppy job in transporting the thing, because a worker on the Alaskan Oil Pipeline brings a bit home in a canister. He throws it in the freezer to take to a lab for analysis, his wife decides a beer cooler is a better place for it and then everyone forgets to put it in the beer cooler at all. The Blob escapes; eats a fly, then the formerly frolicking kitten, and then the husband and wife. This sets off a chain of events that include a hippy birthday party, a car accident, a few celebrity cameos (including Gerrit Graham of Phantom of the Paradise (1974) and Chud II: Bud the Chud (1989) fame.) This all culminates in the Blob invading a bowling alley that just happens to have an ice skating rink. According to IMDB, much of this movie was improvised, and it shows. It isn’t improvised well; whole scenes go on seemingly forever in hopes of getting a laugh, but don’t even come close. Somehow the Blob looks much worse than it did in 1958, although I did like the image of it sliding up the bowling lanes. Every character is aggravating, which does result in the one satisfying death at the very end of the film. There are a few nods to the original film, which is odd since in every other case it seems like it's mocking old monster movies. For what is presented as zany comedy, there’s an awfully high death count. Having a kitten murder early in the film, really isn't the best way to show your audience they are about to have a wacky good time. This movie is a train wreck, and there are a meager number of so bad they are good moments to be found within. Taken as a whole, it’s hard to believe that everyone involved with this movie managed to work through their drug induced haze long enough to complete it. Fortunately (or unfortunately) for you, it’s free on YouTube which is about the right price for it.